All systems go at Hardy’s Hampshire Nursery as the Chelsea Flower Show juggernaut rolls on with thousands of plants in and out of hot houses, being coaxed on and held back. Rosy Hardy says, “it never gets easier, every year is different to the one that preceded it so there is no pattern for success to follow, it’s all about adapting and as the show approaches, improvisation”. The three new introductions Gaura lindheimeri “Freefolk Rosy” , Eryngium “Neptune’s Gold” and Trollius “Dancing Flame” will all find their way into Rosy’s large Floral Pavilion display which will also boast a dozen softly clipped Yew trees standing 6 ft tall, positioned at the end of two rills and forming an avenue down the path. The rills will be a metre wide, edged in blue brick and containing still water. The breeder of ‘Neptune’s Gold is Neil Alcock, a plantsman from north Wales and manager at Seiont Nursery for 25 years. He developed Neptune’s Gold in his own garden by breeding from other varieties of E.zabelii and immediately recognised the potential of a variety with golden foliage, the first all gold variety of Eryngium. 4000 of this amazing plant will be available the week before the RHS Chelsea Flower Show. In addition to growing for their own Chelsea exhibit Hardy’s have been growing the shade loving plants for the under-planting of the Oaks on Helen Elks-Smith’s garden for City of London Corporation and also for ‘Perennial’, the Gardener’s Benevolent charity which will be celebrating 175 years of helping horticulturists. Perennial’s display will be in the marquee with planting designed by Jo Thompson and plants grown by Hardys’. The right plant, right place mantra continues to influence all of Rosy Hardy’s displays and show visitors will see how simple it can be to work with nature, the soil and aspect that one’s garden has and achieve the best possible results. The climate this year gives Hardy’s the opportunity to show some early summer favourites such as ANCHUSA azurea ‘Loddon Royalist’ whose Alkanet flowers come in a range of blues, held above very coarse, hairy leaves. A sunny, free-draining site is best, with little or no disturbance. Deadheading will encourage flowering and removal of the dead flower spike will promote basal growth. For sun or part shade any good soil try Cirsium rivulare ‘Atropurpureum’ 90cm x 80cm Red/purple thistle flowers, with no spines, in spring and summer. These plants make an ideal addition to a garden situation and are generally easy to grow. Verbascum Gainsborough, (Cotswold Group) ‘Gainsborough’ AGM 120cm x 45cm Soft has yellow flower spikes in summer and requires full sun, and well-drained soil. 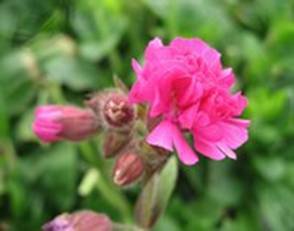 For shady areas try Silene dioica Firefly PBR which requires well drained soil and looks great in summer with Magenta-pink double flowers. Another early summer, part shade lover is Gillenia trifoliata AGM which sports Dainty white star-like flowers on red stems. This plant commonly known as Indian Physic gets its name from its history of use in herbal medicine, but is poisonous if used incorrectly. It is also valued for its autumn colour.